It's nearly 2 p.m. Eighteen year-old Richard Stephen rolls out of bed in his Florida home and fires up his PlayStation 3 to play a round of PS3 exclusive God of War III. He spent the night before, flipping on his computer, wishing that Sony made an operating system so he didn't have to use Microsoft's and then scanning game sites. After feeding Xbox trolls and after owning noobs on Uncharted 2, Richard, exhausted, collapsed into bed sometime between 3 a.m. and 6 a.m. Stephen lives and breaths PlayStation. The PS3 console is an electronics device made from plastic, metal and wires. But self-described Sony fanboy Richard Stephen will defend it virulently. There have to be reasons for this. Turns out, there are, reasons rooted deeply in childhood memories of play and adult concepts of brand identity. A stigma exists about about fanboys (and fangirls, too, for that matter!). It's thought that these diehards blindly love a product or that toe the corporate line — or worse yet, that their feelings toward a certain console can be irrational. These are the folks who get worked up whenever their machine is attacked. These are the stereotypes. This article is not about the stereotypes; however, those stereotypes are bound to rear their head! Instead, there has to be a deeper reason as to why many gamers identify themselves as an Xbox 360 gamer, a Wii gamer or a PS3 gamer. "If we were to apply the same stigma fanboys have to fight with sports, it'd be ridiculous," explains Stephen, who has charts and graphics saved to his computer that he can whip out during heated arguments over which system has better games. "Say I've grown up a Detroit Lions fan, all my life. My dad used to take me to games in the 90s when they were good, and I loved them." And even though the Lions haven't been good in ages, Stephen still follows them. "But, if this were like the gaming world, we'd have fans of the Patriots going like 'New England is obviously better so stop watching Detroit and start watching the Patriots.' Or you'd have people that go like 'I only watch teams that are good right now' or we'd have neutrals, that are like 'I just watch the games, I don't care who is who, they're all the same.' People forget some of us have a tradition with these consoles." An unmistakable bond exists between some console owners and their consoles, and it's akin to the connection some drivers have with their cars. "I grew up on Sony and all of my best memories center squarely around the PlayStation brand," explains Richard, who bought a PS3 with his first paycheck. He's never had a bad memory with the PlayStation. "I care just as much about it as it cares about me," he says. "There is tradition and happiness in the PlayStation brand, and I will certainly never forget about it." Richard remembers the first time he played a PlayStation. He was in first grade at the time, and it wasn't even his console. "Someone from school told me about a kid that lived in our neighborhood that was fun to be around, and gave me directions to his house," he recalls. He stopped by, and the kid's mother answered the door and let him in. The memory is still vivid, and Richard recalls that the kid was sitting in his room, playing Rayman on a black and white television. He asked the kid if he had any other games. He did: Final Fantasy VII. Traditionally, the thought has been that video game fanboyism has its underpinnings in economics. Your average child does not have a large enough allowance to purchase all the video game consoles. And when parents, hoping to delight their children and not spoil them at the same time, offer to buy them a console, in the past it has been one console. Later in the year when he first experienced Sony's console, the six year-old Richard got his own PlayStation. Eventually his brother broke the console, but all those games — from Bushido Blade to X-Men Mutant Academy — he played are burned into his brain. "I played Final Fantasy VII for hours on end," he recalls. "I didn't have a memory card but I didn't care." And when he finished it, he sat there. Satisfied. In the old days, young gamers were forced to choose. Do you want a Sega Master System or a Nintendo Entertainment System? And a generation of gamers (myself included) saw consoles they owned become extinct relics like the TurboGrafx-16 or later, the Sega Dreamcast. These consoles were casualties of earlier console wars, and those who owned them were figuratively the losers. When things have been bad for Sony or the Xbox 360 this generation, the memories of those fallen consoles of the past have haunted the console war. There has been more at stake than simply game machine processing power. The console's very existence is at stake! But, there must be something even more profound that drives a fan of a PlayStation or any other gaming console to defend it so fervently. There is an emotional attachment that exists between the user and the end product. It's not just the actual console itself, but the entire experience — from the box (which is why unboxing videos are popular) to the font (which is why logo changes are big deals). "Great brands demonstrate their values; they don't just declare them," says brand expert Alina Wheeler, author of Designing Brand Identity, one of the definitive works on the subject. "Strong brands make you feel as if you are a part of a very special tribe of people who are like-minded in their passion and experience." Branding isn't just creating an image or conveying a concept, but giving consumers the feeling of belonging to a larger group. "While brands connect to the mind and heart, brand identity is tangible. You can see it, hear it, and feel it." In other words, seemingly meaningless fanboy arguments are people having it out over very real things! Wheeler points out that it isn't only the manner in which the console is presented, but also the game experience they offer. "Users fall in love with their consoles," says Wheeler, "since they connect them to the gaming experience." Think exclusives don't matter? For those hoping to have a specialized affair, they most certainly do. The difference between exclusive and multi-platform games is the difference between tailor-made and off-the-rack clothing. "Great brands make consumers feel like there is someone who understands who they are, what they like, and what delights them." The average gamer is now well-on into his or her thirties. However, it is the memories of youth that form us. Wheeler notes that brand identity can change over times, just as one's politics or beliefs. However, gaming is slightly different than, say, mobile phones or computers. There is something much deeper and far more emotionally engaging about video games. Typical electronics might be viewed as tools — things that enable us to do things better, faster and more efficiently. Video games do not necessarily do any of those. Rather, they have the power to take us into other worlds, present problems and raise our heart rate. Those are the memories that linger, and the context that surrounds them and that inspire some players to leave permanent reminders. 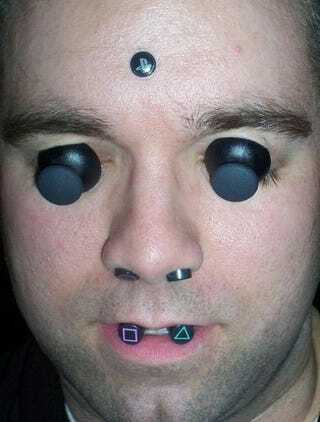 When gamer Sjoerd van Gestel was 17, he wanted to get a piercing, but his mother was against it. A tattoo did get the okay from his mother. "I got the idea to get the Nintendo logo because of what it stood for in my opinion," he said. "Nintendo has made gaming from what it was back in the 80s to what it is now, and being born in 1986, I grew up in that period, making me someone from the Nintendo generation." However, it was getting a Game Boy from his grandparents when he was four that causes Nintendo to truly resonate with him. "I still treasure those memories," he adds, "now that my grandparents have both passed away." For Sjoerd, that Game Boy has ceased simply being a video game portable just as Nintendo has ceased simply being a Japanese company and that Nintendo logo on Sjoerd's leg was no longer corporate branding. These consoles have the power to connect us like never before — not just to our own memories, but to each other. Online console gaming has created new social networks. "I'm not sure why I like the Xbox 360 so much," says Matt Torr, who boasts 80,000 kills in online play in Halo 3 multiplayer. The Xbox 360 was the first console he got this generation. "I used to have a PS2 then I moved to the Xbox, so that's why I decided to buy an Xbox 360," he adds. "Over the years playing online I have made a lot of friends (and enemies), then I got my PS3 and I just don't want to leave all my friends on the Xbox." Stephen Richard, who still loves PlayStation most, likes to say that if we didn't follow a certain game company, we'd just end up with one console, the PSWii360, with no originality between them and nothing to make a console "pop" off the screens. He doesn't have a problem with the Xbox 360 console itself, well, not exactly. He explains as he clacks out an email at his computer: "The console itself never spent 10s of millions of dollars to shorten Final Fantasy XIII and make the PS3 version look terrible just so the 360 could have it." He's reading websites. He's championing the PlayStation 3. It's another late night with more gaming or game news in store. And, no, he doesn't hate that Xbox 360. "However," he notes, "I completely loathe everything about Microsoft and its rabid fanboys," he concludes. "They are a bane on society and I wouldn't ever be caught dead being around either of the two."